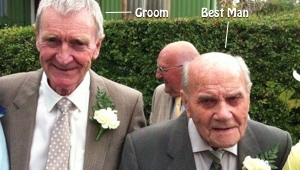 OLDEST BESTMAN IN THE WORLD! At 102, Dan Clement thought his days of partying and being a best man was well and truly over, well actually you couldn’t be more wrong. Not only did this plucky retired farmer become the oldest Best Man in the world (at 102 years of age), he also arranged the Stag Do and cracked the crowd up with his killer best man’s speech about being a Ploughman and jokes about cows! Dan’s lifelong friend, Alex Sandy who is a spring chicken at 73 years old said that Dan’s age was not even a consideration when it came to asking him to be best-man and didn’t even know that it would break the world record. The previous World Record for being the oldest best man was held by Ronald Hornby in Northern Ireland who was 96. They also didn’t duck out on a Stag Do, this consisted of sitting up most of the night drinking shots of whisky and bottles of wine around a house in Cornwall, I would love to have been a fly on the wall on that night and heard all the old stories and jokes, totally awesome. Alex Sandy who got married to Sue in Scotland (who met online) thought they were going to have a quiet wedding but the Guinness Book of World Records caught the media’s attention and before they knew it there was TV camera’s and paparazzi at the church! The last and only other time Dan was a best man was in the 1940’s, how mad is that? All the above details was taken from an article on the Falmouth Packet website which you can find here. We at DesignaVenture would like to wish Alex and Sue from St Austell all the luck in the world for their marriage and here’s to Dan being asked again. A Stag Do going to Bristol had a last minute drop out so instead of a no show they decided to auction the place on eBay. 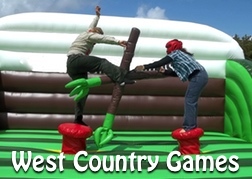 According to an article on the Bristol Post website, these plucky lads from Andover booked West Country Games, Indoor Crazy Golf, bar, club entry and 1 night’s accommodation for their Bristol Stag Do. Apparently they had over a 1,000 views but the listing only went for £1.21 and was snapped up by a lady known as Josie. She couldn’t do the whole Stag Do so met them in town for the Crazy golf and a few drinks around town. One of the group said, “like them, she loved the idea of it and did it for a laugh”, however the group said the whole eBay stunt gave the weekend a great buzz. Bristol is a fantastic UK stag destination and over the last couple of years has become extremely popular with stag and hen parties. With fantastic activities in the day and amazing nightlife, Bristol is possibly the busiest city for stags and hen travelling from other cities. For some amazing stag packages get yourself over to the DesignaVenture bristol stag do section, where we have packages starting from £79.00 per person*, equally we also offer amazing hen party breaks starting from £95.00 per person*, you can view these packages here. 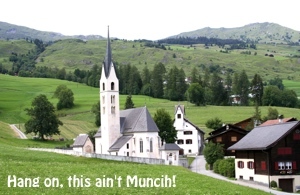 According to a hilarious article in the Evening Standard, a drunken Londoner swapped a Stag Do in Munich for a day out in Switzerland courtesy of lackadaisical driver. Jordan Adams a 33 year old from London, stumbles out of a Munich club looking for a cab to take him back to his hotel, somehow manages to clamber into a luggage hold of a coach and falls asleep. 4 Hours later he’s woken up by an irate coach driver “effing and jeffing” no doubt wandering what this silly Englishman is doing in the luggage compartment of his coach! Jordan a company director who was attending his Brother in Law’s Stag Do had to ring “her in doors”, to get her to call her brother and explain where he was (she was very happy as you can imagine). He then had to go and speak to the Swiss police as he had no money, passport or phone to help him out. The Swiss police very kindly stuck him on a train back to Munich! Wasn’t this a prank they used to on the stag, stick him on a slow ferry to Calais or similar? If you have any funny stories, please send them though to dean@designaventure.co.uk plus any images you may have to back up your funny story.